Like any self-respecting Film Nerd, I spend far too much of November and December considering my favorite films from a given year. For 2011, I decided to do things a bit differently. I did not get a chance to watch an awful lot of movies this year, as I spent most of 2011 finishing up The Nocturnal Third. Despite this, I did decide to cut off qualification for my “official” list on December 31st, as this list takes stock of only the films I watched this year. After experiencing the “other side” of film criticism this year with the release of my first feature film, I more than ever consider myself a filmmaker and film enthusiast rather than a film critic. This allows me to revel in the lack of expectations usually attributed to a serious critical analysis of a film year. I’ve decided to do away with letter grades this time around, as they tend to become more and more arbitrary as I see more and more movies. Another by-product of making my own film is that I’m more in love with movies than ever. When I say “movies”, I mean cinematic stories – best viewed as encapsulated pieces of art in a controlled environment. This does not include serialized television, video games, or transmedia. These things are not bad things. In fact, they are amazing, sometimes cinematic things. But, I’ve resigned myself to leave these out of my area of passion, because they are not cinema. 2011 has taught me a lot about my own perception about movies, my own gravitation towards the craft of directing, my lack of interest in obviously “socially conscious” films, and my formalist leanings. I look forward to a juicier experience as a film fan going forward due to these discoveries. Wow, can you tell this is going to be a long post? All that said, I’ll probably revise this top ten list around Oscar time, in late February. I will, however, be watching movies less aggressively now that the holidays are over. There are plenty of good-looking movies from 2011 that I missed, and here are the ones I really wished I could have seen: The Artist, Carnage, Cave of Forgotten Dreams, Cold Weather, A Dangerous Method, The Descendants, Detective Dee, The Girl With The Dragon Tattoo, Into the Abyss, A Separation, Shame, The Skin I Live In, Tinker Tailor Soldier Spy (the biggest shame, as it gets a wider release next weekend), Tyrannosaur, Warrior, and Winnie the Pooh. What follows are, as of 01/01/2012, my ten favorite movies of 2011. There is a bit of theme here, and I’ll expound on that on the south end of the list. Enjoy! Man, this number ten spot was hard to decide on. This pick is somewhat representative of the entire accomplishment that is the Harry Potter franchise, but I don’t want that comment to betray the phenomenal film that this is. A fast-paced, singularly-minded adventure film, Deathly Hallows Part II is a perfect mirror image of its predecessor, which was a slow-burn set-up of a character piece. The conflict between Voldemort and Harry had been extremely well established by the time this film begins, and their eventual clash is the stuff of great, well-earned cinema. Bravo to Steve Kloves, Chris Columbus, Alfonso Cuaron, Mike Newell, David Yates, JK Rowling, the cast, and – quite possibly, above all – producer David Heyman for shepherding this story in an amazingly conscientious and focused way. Let the record show that in 2011, the year of widely publicized social upheaval, the first movie to comment (perhaps accidentally), was the best Planet of the Apes movie since the Charlton Heston original. Reducing the imaginary tension between man and ape to a simple story of the misperception of “ape rights”, writers Amanda Silver and Rick Jaffa hit on a wonderful perspective. Limiting the story to the experience of eventual ape leader Caesar gives this wonderful canvas of socially-conscious science fiction the spark it needs to speak to our time. This is the purpose of science fiction and, by extension, all fiction: To comment, from a safe and speculative distance, on where we are and where we’re going. I shouldn’t leave out the fantastic job that director Rupert Wyatt did in guiding the film through its three forms: a coming-of-age story, a prison movie, and a gripping war film. I think it’s safe to say that, in addition to being in a third Golden Age of Animation, we’re also in a kind of second Golden Age of Revisionist Westerns. Kelly Riechardt continues her impressive run of simultaneously personal, regionally-specific, and thematically loaded feature films. Is this film subtle? Some of the time, yes. I’d say that Michelle Williams gives one of the most understated performances of the year. Can the same be said for Paul Dano’s performance, or the writing of Bruce Greenwood’s Meek character? No, not at all. However, the arch approach that screenwriter Jonathan Raymond and director Reichardt take to tell this story runs parallel to the film’s clear-cut stakes and sparse visual style. Right, so you remember that third Golden Age of Animation I mentioned? I think, at this point, to the chagrin of many detractors, we can add motion-captured CGI features to that growing showcase. With this adaptation of the Herge comic books, Steven Spielberg enters the animation fray, and gives us a case study in the merits of motion capture for fully computer-animated movies. Yes, we lose a level of tactile interaction and tangible texture, but we gain a broader potential for performance and camera movement. Here, with a story that has one foot in comics and one foot in adventure serials, Spielberg stages some of the most amazing action sequences we’ve seen in years, coupled with a pace and overall aesthetic that wouldn’t have been possible in any other medium. “Fun” Spielberg is back at the top of his game, and we can probably attribute a lot of this verve to a measure of competition with one of his screenwriters: quite possibly one of the most dynamic and fun filmmakers working today, Edgar Wright. I was not expecting to love this movie. In fact, I was adamantly opposed to enjoying it, feeling that its action-heavy and poppy trailers communicated a betrayal of the Mission: Impossible series’ Cold War roots. I wanted a more cerebral, paranoid spy thriller, not another bad John Woo rip-off. Add to that the fact that the film featured a great director in Brad Bird, seemingly paying the necessary dues to pass into the world of live-action filmmaking. It all felt like a transparent grab at cheap publicity for the series and its star. With all that said, I eat my words. 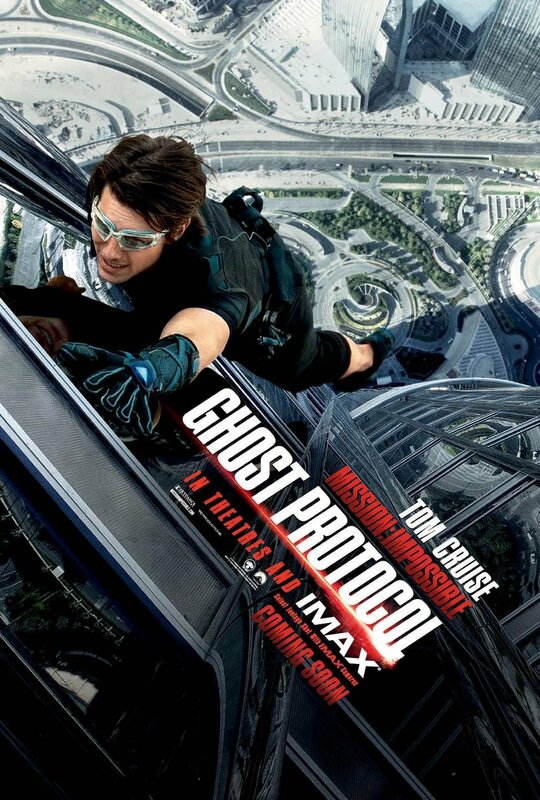 Not only is this a loving ode to the original series, and an apt modern adaptation of the essential idea behind the 1960’s Bruce Geller creation, but Ghost Protocol is also the best pure action movie since Casino Royale, and – gulp – quite possibly even better. Here, Brad Bird takes the Thirty-Nine Steps approach and makes things very simple: “We need to go here, and do this, or else that happens.” Then, he tips over the dominoes and watches everything fall apart while our characters scramble to make things right. This is a movie about embracing and overcoming failure, in a genre and an industry and a culture that loathes the stench of failure. It also positions this series as a worthy American answer to James Bond, with a bright future and unlimited potential for future installments and characters. This movie is also a great encouragement that audiences will still respond to practically-produced big screen extravaganzas; just look at the past few weekends’ box offices grosses to see how people are flocking to see stunts and excitement they just can’t witness anywhere else. Here we have one of the best – and most frightening – character studies of the year. In his sophomore effort as writer/director, Shotgun Stories auteur Jeff Nichols tells a gripping and empathetic story about a man in deep psychological turmoil, and the toll it takes on his young family. Michael Shannon appears to be making a career out of this sort of thing, building on his great performances in Revolutionary Road and My Son My Son What Have Ye Done? The difference here is that Shannon’s character is as empathetic as Nichols’ screenplay and camera. This film never beats up on the family at its center, but rather uses perceived insanity as a lens through which it observes a middle American familial unit. Nichols proves his prowess with a superbly strategic approach to shot selection and editing, combined with a focused script that features a gut-punch of an ending. Man, don’t you hate a cheat? I’ll qualify this ranking by saying that this spot is not reserved for two films, but for one amazing double feature idea; not one 112 minute-long movie tied with an 88 minute-long movie, but one 200 minute-long cinematic look at the alien invasion genre through the eyes of pre-teens. The similarities between the two films are impossible to ignore, and yet they offer two enthusiastically divergent experiences. One is a loving homage to the 1980’s films of Amblin Entertainment, shot in that specific house style. The other is a loving homage to John Carpenter films from the same era, shot in a wholly modern style. It’s the kids of the suburbs and of the city, looking up at the sky and watching intruders pay us back for our own sins. 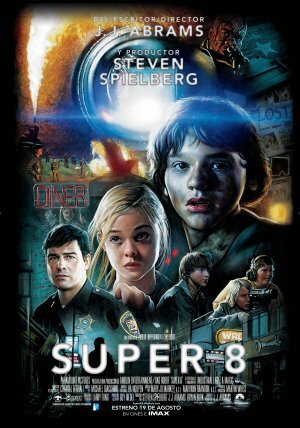 Super 8 falls in line with the predominant preoccupation of many 2011 films, in that it explores the roots of cinema – albeit in a personal sense. 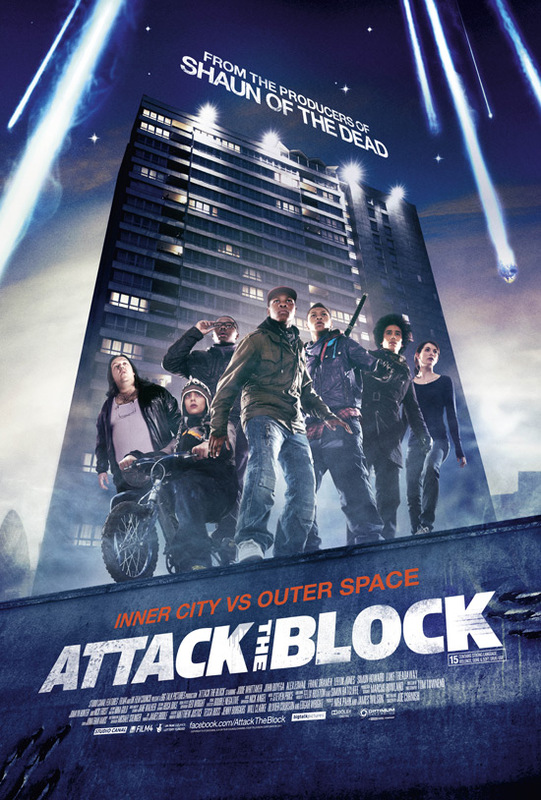 Attack the Block is more concerned with the predominant preoccupation of 2011 headlines, tackling the idea of global social responsibility versus regional social responsibility. Both films are touching, responsible, and at times, terrifying… and then, at other times, just kind of badass. There might not have been a more divisive film in 2011 than Terrance Malick’s latest “tone poem”. 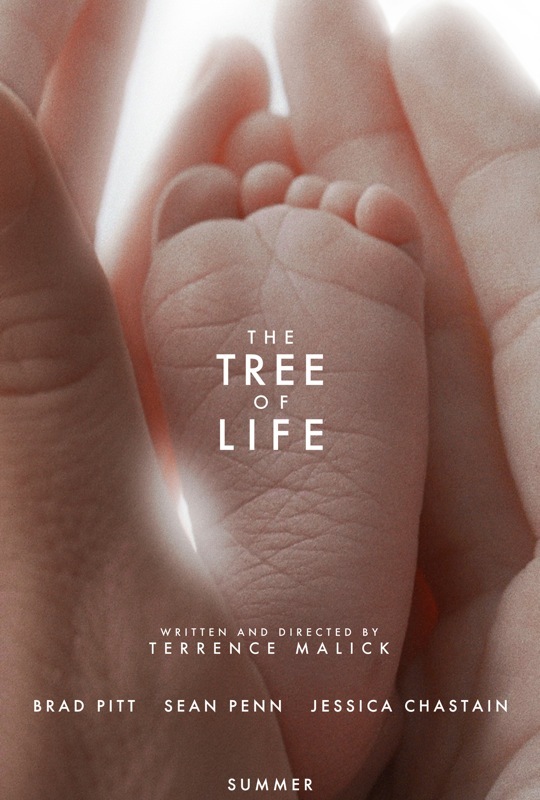 The Tree of Life is a kind of Malickian demo reel, encompassing many of his favorite themes: those of grace, shared memory and psalmic introspection. It’s impossible for me to approach this movie with any measure of critical objectivity. It speaks to my personal beliefs, and to what I believe is our consistent human struggle. 2011 was a year in which I found it was time for me to let go of screenwriting for a while. I’m in the midst of a kind of spiritual re-awakening that will do nothing but propagandize any fiction I lay my hand to, so I’ve focused in on what has always been my biggest goal and, in my own opinion, my greatest skill: directing. The Tree of Life, in addition to showing off an extremely measured and sage approach to the struggles of faith, played a small part in this personal renewal of mine, and I encourage other Christians to approach it with an open mind. It’s rare that a film strives for any kind of transcendence and actually succeeds. Typically, they tumble and crumble, revealing a series of hollow, murky priorities. In this case, it worked for me. The Tree of Life is not an ultimate thing, it shouldn’t be treated as a hoity toity, untouchable movie unable to be scrutinized – but that doesn’t mean it’s not extremely important and wonderful. Speaking of spiritual awakenings… how ‘bout some cults? Sean Durkin’s first feature film is, again, one that I went into with arms crossed. A “Sundance darling” is not something a struggling independent filmmaker is going to go out of his way to praise, but the precision and deftness of Martha Marcy May Marlene pierces any and all jealousy I may have been harboring. This film has affixed itself to my brain, in the way that any great psychological horror film should. Durkin has made a thriller in the vein of Roeg and Polanski, with a minimalist approach that allows tension to grow like a bacteria. The performances, especially the magnificent one by Elizabeth Olson, are as quiet and subtle as the script’s tone. The way Durkin and cinematographer Jody Lee Lipes control their focal planes and camera movement is an encouraging sign of a smart, sharp partnership. This is, in some ways, the smallest movie on this list, but it is also one of the richest and most thematically loaded. Over the past few years, while the rest of Hollywood and the industry media were prattling on about the proliferation of branding, the dangers or merits of 3D, and the anxiety over theatrical exhibition giving way to online streaming, Steven Spielberg was busy keeping his down and making a movie. A real movie. A real, physically tangible, visually poetic, humane, and essentially moving movie. A classical Hollywood production that embraces its roots and its setting. People will rub up against War Horse for its suspiciously earnest tone and full-hearted sentiment, but that friction is a symptom of our culture, rather than a problem with this movie, which earns every moment. I will fully admit that it took me most of the film to get over the fact that we are given little to no reason why the young man at the center of the film loves his horse so much. When the realization hit me that this is not just another time and culture – in which irony and boredom did not exist – but also a type of cinematic fairy tale of the Night of the Hunter or Searchers ilk, I was in for the ride. War Horse is essentially a series of episodic vignettes in which the humanity of various characters is reflected against the helpless experience of a scrappy horse, and yet the movie never loses its pace. Some characters are more involving than others, but the film is structured in a brilliant way. The story brings back earlier thread as soon as its current thread threatens to run thin. Here, Steven Spielberg has crafted a movie that does not take the last two decades or so of cinematic grammar into consideration, and that kind of brazen anachronism is fascinating. I hope these points don’t sound like empty justifications, but if they do, so be it. As Spielberg tossed our generation’s hopeless “quest for cool” to the wayside, I’ll gladly do the same: At this point, I can gladly say that War Horse is a great movie, quite possibly the greatest I’ve seen since something like Children of Men or The Dark Knight or No Country for Old Men. We’ll see if that opinion still stands over time. Honorable Mentions: It pains me to have not included Hugo, Contagion, and Drive on my list, but I think that only goes to show how strong of a year 2011 was. So, if you haven’t noticed a theme in my list – especially in entries 1, 2, 3, 6, and 8 – I’ll go ahead and blurt it out: Naturalism. What I’m encouraged by in the filmmaking of 2011 releases is not so much naturalism in plot or performance, but a kind of technical naturalism. Even as things become more and more digital, our greater filmmakers seem to be going out of their way to give their movies a tactile, real texture. Whether it be the real wrangling and stunts of Fast Five, War Horse, and Mission: Impossible – Ghost Protocol, or the long takes of Martha Marcy May Marlene and Meek’s Cutoff, or the natural, expressive lighting of Tree of Life and Drive, it really feels like cinema will continue to thrive through sensory experiences that cannot be matched on television or in video games. I’ll add a re-assertion that the overall thematic through-line of 2011 film overall seems to be “Memory and Nostalgia”, the way 2010 films all seemed to look at “Preferred Realities”. Many films this year dealt with either a blur between dreams, memories, and present realities (Martha Marcy May Marlene, The Adventures of Tintin, Take Shelter), or spent much of their time inside memory, via nostalgia – be it cultural or personal (Midnight in Paris, Hugo, Super 8, Captain America: The First Avenger, War Horse). Other movies I saw that I would really recommend are, in order of preference, as follows: Captain America: The First Avenger, Midnight in Paris, Bridesmaids, The Muppets, Transformers: Dark of the Moon, Fast Five, 13 Assassins, Moneyball, Rango, Thor, and X-Men: First Class. Alright, now that the fake heady analysis is over with, let’s get to the fun part… POINTLESS RANKING!!! These are, of course, my personal favorites in any given category. 9.) My Son My Son What Have Ye Done? That’s it! Why are you still reading?!?! Oh, to find out about my movies? Check out A Genesis Found and The Nocturnal Third and find us on Facebook and on Twitter, @WonderMillFilms.